Another swipe on the misty screen of my phone made me turn again into the direction of the looming goddess before me, now with glowing red streams cascading ever so breathtakingly, outlining the magnificent cone and lifting its elegant shape against the shadows of the night. One more glance on the screen. It read a new announcement posted just a few minutes ago. It was, at long last, final. After a streak of five days of cancelled classes, life would finally resume tomorrow. While most of us were reluctant to believe the worst was over so that it could be insisted that school and work be pushed back to the following week and avoid the inconveniences of the extended interruption, the people who live in the 2nd district, a stone’s throw away from Daraga, on the other hand, had their ears pricked hopeful for the first word about their barangays being finally safe from harm and the earliest announcement of their return to their homes. Their much-awaited news, however, was taking way longer than they could allow. Being stripped of their livelihood, natural resources, and the security of their home, most of the evacuees fell helpless to the aids of the government their daily needs. But its assistance certainly was not enough. In addition, given a new environment where conditions were proved to be more difficult than their original situations, more problems formed especially regarding health, adding more issues into the pile that has already formed quite a mountain with every extended day. It is one of advocacies of the new generation of doctors to be a functional arm of the society in addressing emergencies, particularly when they concern the local communities. This form of service that transcends beyond the pride of acquisition of knowledge, skills and prestige has become a prominent caption last February 10, 2018 during the medical mission and relief operation conducted in Cotmon National High School spearheaded as partners by the Association of Medical Doctors of Asia (AMDA) led by Dr. Elrey L. Navarro and Sanggawad of the Bicol University College of Medicine for the displaced families of Brgy. Upper Cabangan, Camalig, Albay. 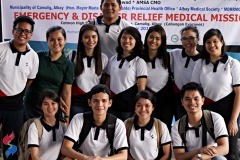 The team was comprised of 80 participants made up of medical doctors, nurses and volunteers from different institutions such as AMDA Philippines, AMDA International HQ, AMSA Philippines, Salamat Dok, Asian Mobile Medical Services, PCOM Bicol, PCOM Quezon City, together with the medical students from BUCM. During the whole day activity, a total of 266 patients were seen and 28 various chief complaints were recorded on 138 individuals who consulted for their disease. The highest frequency was noted on cough and colds (48 patients) followed by cough (15 patients), abdominal pain (11 patients), soft stools (8 patients), and colds (7 patients). “Overwhelming sa pakiramdam…na-feel nila na parang nasa special clinic sila, na sila ang sinadya ng doctor at hindi sila ang pumunta. Personally, lubos-lubos ang pasasalamat ko. Di ko ito in-expect.” (“The feeling was overwhelming…They felt like they were in a special clinic that it was the doctor who came to see them. Personally, I am truly very grateful. I did not expect this.”) Brgy. Captain Purisima Victoria G. Nocedo said in an interview after the event. She in tandem with the Principal of Cotmon National High School, Ms. Natividad Rapesora, has taken in the evacuees in their shelter for more than two weeks and has attended to their needs during their stay. Many mothers like Amparo took the opportunity to receive food supplements for their children who found the rations insufficient for their growing children. In addition to medical services, the team also conducted health-and-wellness teaching and provided relief goods to the affected families through the contribution of supplies and materials from several sponsors such as AMSA-Philippines, Albay Medical Society, Toyota Vios Fairview Club, Team Dapoy, and Makati Medical Center. As the four-word slogan of Sanggawad says, service, camaraderie, benevolence and resilience are important in establishing a sustainable community with a networking system rooted to the diverse fields of profession and an unwavering optimism amidst any disaster. These core elements have found home within the community and have started to root, as the evacuees felt life beginning again realizing that even weeks have passed since the threatening activity of the volcano, they were never forgotten. “Pagkatapos nito, gusto ko ring maging katulad nila…makatulong sa ibang tao. Parang gusto ko na ring maging doctor. Sana makatulong pa sila sa ibang tao.” (“After this, I want to be like them…to be of aid to other people. I think I want to become a doctor. I wish they could help more people.”) Bianca Laag, 13, said in an interview. Surfacing in this activity was the truth that what transcends time and space is not the philosophy of the medical profession, the knowledge and skills, or the pride of a doctor – but the caring hand of another man who has come for another who was in need.